The resolution was a harsh bipartisan rebuke to Trump that took the historic step of curtailing a president's war-making powers -- a step he condemned in a statement announcing his veto. "This resolution is an unnecessary, dangerous attempt to weaken my constitutional authorities, endangering the lives of American citizens and brave service members, both today and in the future," Trump said. Vetoing the measure is an "effective green light for the war strategy that has created the world's worst humanitarian crisis to continue," said International Rescue Committee president and CEO David Miliband. "Yemen is at a breaking point with 10 million people on the brink of famine. There are as many as 100 civilian casualties per week, and Yemenis are more likely to be killed at home than in any other structure." Trump argued that US support for the bloody war between the Saudi-backed Yemeni government and Iran-aligned Huthi rebels was necessary for a variety of reasons, "first and foremost" to "protect the safety of the more than 80,000 Americans who reside in certain coalition countries." These countries "have been subject to Huthi attacks from Yemen," he said, referring to drone and missile strikes the Saudi-led coalition has either claimed were intercepted or denied altogether. The president also said the resolution would "harm the foreign policy of the United States" and "harm our bilateral relationships." 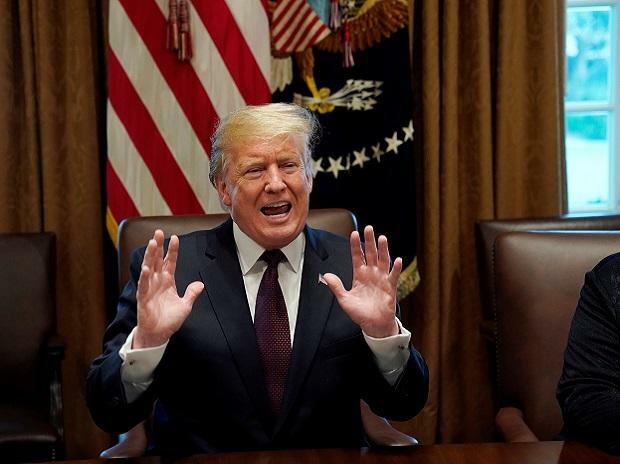 And it would "negatively affect our ongoing efforts to prevent civilian casualties and prevent the spread of terrorist organizations such as Al-Qaeda in the Arabian Peninsula and ISIS, and embolden Iran's malign activities in Yemen," Trump said, referring to two Sunni Muslim militant groups and his Shiite bete noire. The resolution, which passed the US House of Representatives earlier this month and the Senate in March, was a historic milestone, as it was the first time in history that a measure invoking the 1973 War Powers Resolution reached the president's desk. Democrats argued that US involvement in the Yemen conflict -- through intelligence-sharing, logistical support and now-discontinued aerial refueling -- is unconstitutional without congressional authority. Speaker of the House Nancy Pelosi -- the country's most senior Democratic politician -- took aim at Trump's veto in a series of tweets on Tuesday. "The conflict in Yemen is a horrific humanitarian crisis that challenges the conscience of the entire world," Pelosi wrote. "Yet the President has cynically chosen to contravene a bipartisan, bicameral vote of the Congress & perpetuate America's shameful involvement in this heartbreaking crisis." Senator Bernie Sanders, a lead author of the Yemen resolution and a Democratic 2020 presidential candidate, said that "the people of Yemen desperately need humanitarian help, not more bombs." "I am disappointed, but not surprised, that Trump has rejected the bi-partisan resolution to end U.S. involvement in the horrific war in Yemen," Sanders tweeted.